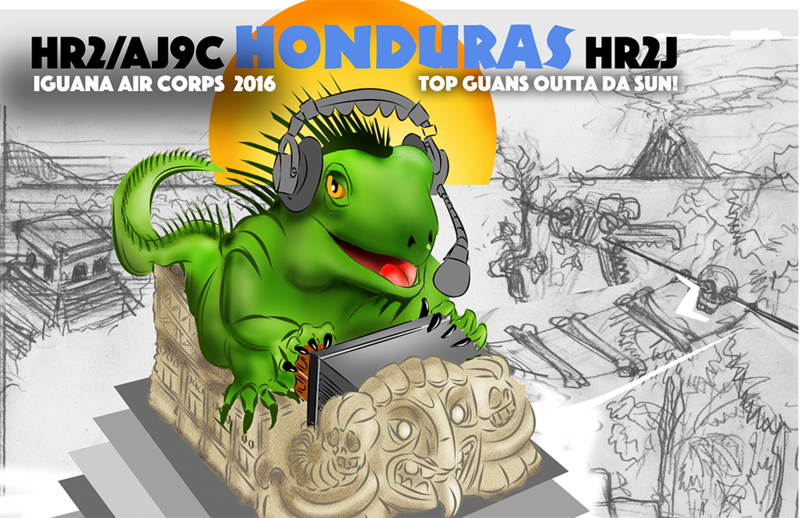 ©K9IZ We adapted the logo for the Iguana Air Corps club QSL, which some members customized with their own calls. If we design your logo, you own it, and we can help with any adjustments needed for a variety of applications. ©AJ9C One of these would make a nice ham shack/tower combination. It all began for me when AJ9C, a well-known gadabout midwest contester got in touch about a custom QSL card design for himself and a logo for his feisty contest club. Mike’s straight-ahead goodtime style came through 59+ and we hit it right off. Didn’t take long before we identified iguanas as sufficiently green, exotic and cool, with savoir faire to burn. Thus in short order, this lizard became our mascot. But just who was this club of radiosporting rogues and rascals, this band of hambones who took their chances on the air with rare esprit de corps? Ah, so it’s an AIR CORPS isn’t it? As one thing led to another, our iguana mascot’s maverick aetherial combat style suggested what else but ”TOP ‘GUAN, outa the sun Baby! I sketched our Top ‘Guan at a dodgy tropical gin joint, given that AJ9C likes it hot. Seemed to cry out for a KWM-2, that battered Leica of expat radio intrigue. 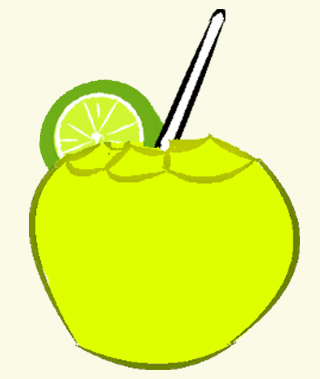 Natch, couldn’t leave out the trash-talking parrot, the lime in the coconut, or the spiral binding on a good-old fashioned paper log, great for soaking up splash from a Scorpion Bowl. And but of course, no rules but three cuz all the rest are stinkin’! Now, logos need to be real simple, so we pared down the props to the leapin’ lizard himself. Mike wasn’t planning on embroidered patches, so we amped up the sun with a gradient, which could be easily made single color if need be. At Art For Shacks, we pay attention to what you want to do with your graphics, because it can make a big difference in cost and viability of a given design for a given application. 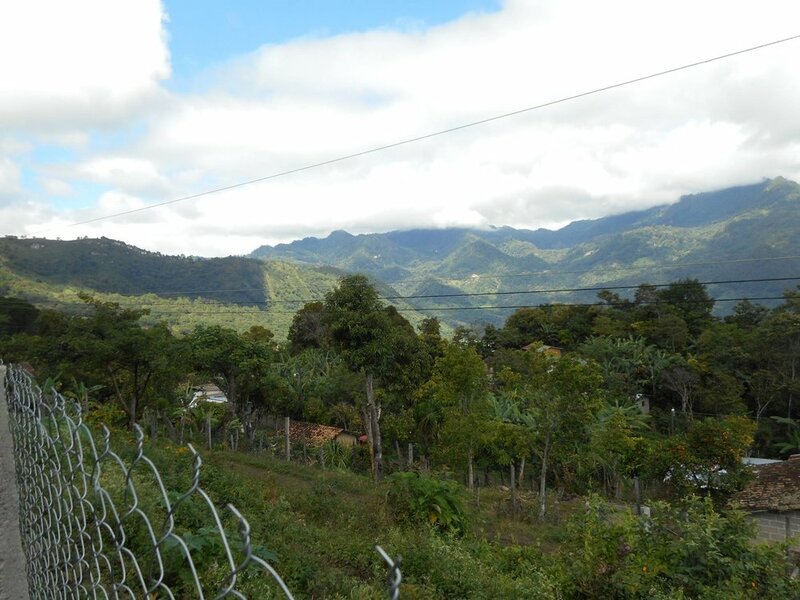 Down the road Mike came back to us for a QSL to mark his Honduran adventure with now sadly SK HR2J. Aside from natural splendor, the region draws visitors worldwide for its Mayan archeological sites and I was excited about including some of that style in the design. First I thought of Top ‘Guan as sculptural, part of a ruined wall. Because a larger than usual amount of text was involved, with dual calls and such, this left little room to give the wall ruin much Mayan context. So I took a different point of view and seated the Air Corps mascot on top of a pyramid. With that part fairly squared away, I penciled in a rough background that would include some other pyramids, sculpture, and your basic Honduran volcano. This was a final check-in point with Mike for a Go to launch. Lots going on, but the many different elements do relate as a larger piece. I was aiming for the classic range of foreground, middle ground and distant interest, pushing it in a 3.5 x 5.5 inch QSL format. Pruned and tweaked a bunch of this and that to keep the spotlight on the Top ‘Guan. BTW, yes, it was impossible to resist the obsidian dogbone insulator. As you can see, it can be a long strange trip between QSL idea and actuality. That’s the journey my clients and I take all the time. No rules finally, just seat-the-pants play-it-by-ear, true collaboration. I think I have a sense for this stuff, but nobody has a sense of you like you. Between us, we’ll figure it out. Are ya game? ©AJ9C Mike set up for DX operations at a Honduran coffee plantation. ©AJ9C Honduran DX Contest Performance Enhancement plant (coffee). ©AJ9C Copan Ruins of Mayan pre-radiosporting events. Whoever winds up with the most points doesn’t get his head chopped off.